Today we want to talk about asbestos drywall removal. If you read our last post all about asbestos-containing drywall and joint compound, then you’ll know that finding a certified asbestos abatement company is crucial to removing your drywall. If you live in the Ohio and Western Pennsylvania area, then we here at Safeair Contractors can help! Getting rid of your asbestos drywall is an important step in creating a healthier home for your family. The problem is that there are a number of contractors out there who advertise asbestos abatement but are not certified! Why does it matter if a company is certified for asbestos drywall removal if they’re getting rid of the problem anyway? Because a contractor who doesn’t know what they are doing can cause a lot of problems for you and your family in the long-run if they don’t follow the proper safety protocols. When removing asbestos, particularly doing asbestos drywall removal, it’s not only about pulling down contaminated building materials. It’s about controlling any asbestos that might be released into the environment. If done improperly, asbestos drywall removal can send asbestos into the air. These particles are then sucked into your air ducts and become a longtime problem. How Do Professionals like SafeAir Contractors Remove Asbestos Drywall? 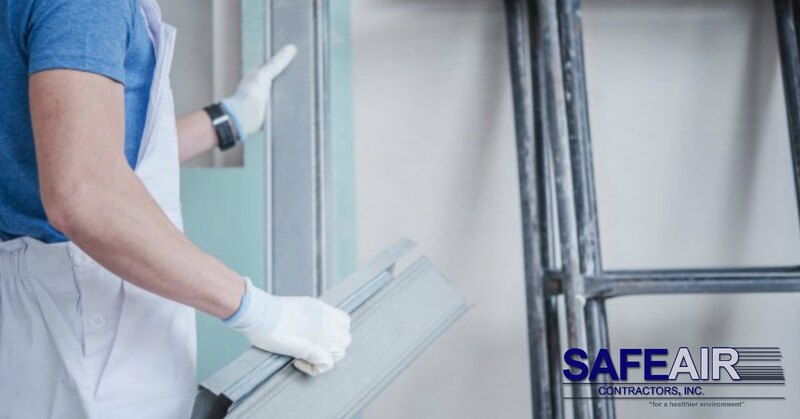 Here at SafeAir Contractors, we make sure to follow all state and federal regulations that govern the safe handling of asbestos. This means that when we come into your home to remove the offending materials we cordon off the affected area AND we take all necessary safety precautions to protect you, your family, your home, and of course, ourselves too! Safety is important to us which is one of the reasons that we started our company in the first place! We don’t want to make a buck from someone with a problem, we want to solve a problem the right way to prevent you from suffering in the future. There is nothing we like less than unscrupulous companies that prey on consumers with no understanding of the proper asbestos removal protocol. Here at SafeAir, we do the best job the right way, every time! Do you live in Western Pennsylvania or Ohio and need an asbestos drywall removal company who follows ALL the rules? Then SafeAir is waiting to hear from you! Just give us a call at 440-639-1191 and we’ll get started on making your home a safer place right away!